Shree Bikaner Property is one of the leading real estate companies located in Bikaner, Rajasthan, well-known for offering Architectural Services according to the different requirement of the clients. We have with us skilled and experienced architects who with their creativity and efficiency can come up with the most effective and innovative architectural design according to the different need and requirement of the clients. 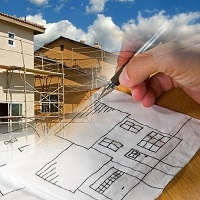 Providing solution for different type of Residential Property, Commercial Property or Industrial Property, we are also offering the Architectural Services at very reasonable charges. Over the years, we have benefited many clients in and around the region by providing world-class Architectural Services. A good interior of a place not only attracts attention but also reflects the taste of the people living in it. Catering to the different interior designing need of the clients, at Shree Bikaner Property, we are offering Interior Designing Services at very reasonable charges. Located in Bikaner, Rajasthan, we are one of the leading real estate companies located in region. We have with us interior designers who has the experience and the creativity to design the most spectacular interiors according to the different need and requirement of the clients. With substantial expertise in this domain, we are offering services for different type of Commercial Property and Residential property such as Commercial Shop/Space, Shopping Complex/Mall, Office Space, Showroom, Flat/Apartment, Individual House, Farm House, etc.